Full Removable Dentures: A denture is a removable prosthesis that replaces some or all of the teeth of a jaw. If a denture substitutes all teeth in the arch, it is called a full removable denture or a complete denture. If some of the natural teeth are still present, than the prosthesis replacing the missing teeth is called a removable partial denture. Full Removable Dentures Full dentures are still the most common restoration used today for edentulous (no teeth present) patients. The only other alternative to the complete dentures is Implants. 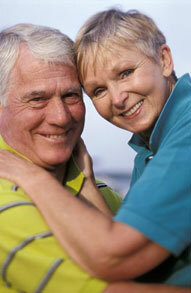 Full dentures are plastic plates custom-made to fit each individual. It is made from pink acrylic simulating gum tissue and plastic or porcelain teeth, custom set for each patient. The name full denture or complete denture this restoration gets from it’s function: it substitutes the full dentition on the patient’s jaw.